LAS VEGAS u2013 Fujifilm has debuted a compact printer designed to print images sent wirelessly from a smartphone. The launch of the Instax Share SP-1 is accompanied by a new app designed for iPhones and Android operating systems. 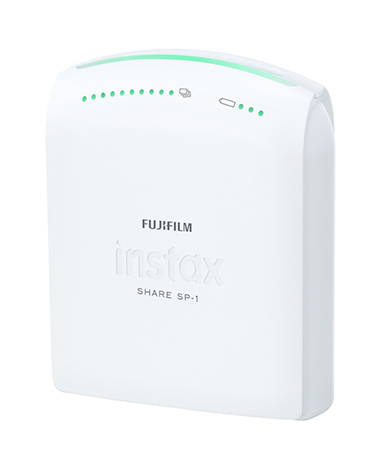 Fujifilm is launching a smartphone printer, the Instax SHARE SP-1, that enables easy creation of Instax prints using images sent wirelessly from a smartphone. Fujifilm’s range of Instax instant cameras, which output photos in the traditional analogue style, has enjoyed a huge surge in popularity recently. This has led to requests from users who wish to produce ‘Instax-style’ prints from their smartphones. The Instax printer is a neat, compact unit measuring 101.6mm x 42mm x 122.5mm and weighing just 253g. It produces a print in a mere 16 seconds and uses standard Instax Mini film for its output. Together with the release of the printer, Fujifilm is also unveiling a free Instax app that is compatible with iPhones and Android models. This app enables users to send their smartphone images to their Instax SHARE SP-1 wirelessly and then print them in Instax frames. The app also offers various features such as image enlargement/reduction and filters including black & white and sepia. A wide range of templates is also available via the app, making photo printing more flexible, fun and creative. The Real Time Template, on which the date, time, place, weather, temperature and humidity are printed on the photo, makes it ideal for holiday snaps. With the Limited Edition Template, each print is marked with a serial number which is perfect for parties or nights out. On SNS Template, images uploaded to Facebook and Instagram can be printed with the profile photo and the number of likes. The Instax SHARE SP-1 will be available in the UK from early March, with an RRP of between £140 and £150.